A pair of Pink Patio Standard Roses for a summer-long display of beautiful fragrant blooms. 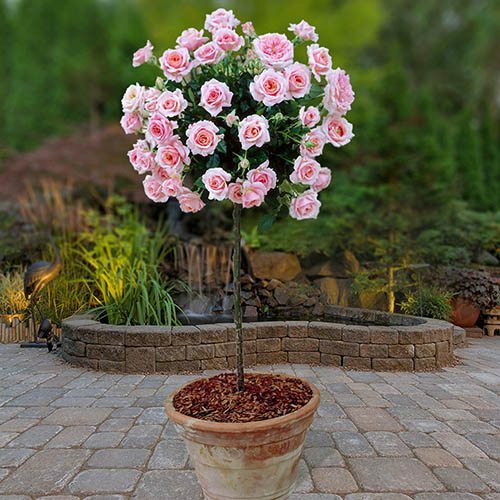 Also known as Tree Roses, they are the perfect way to add height and romanticism to your garden. Perfect for framing patios, pathways and gateways. Supplied as bare root plants, ready to be planted or potted up immediately upon receipt. Transform your garden into a fragrant, romantic haven and add a touch of class to your patio with this pair of expertly-grown standard roses. After three years of hard graft by our expert growers, we are excited to bring you these gorgeous patio standards, perfectly grown and waiting to burst into life in the spring. By carefully ‘top grafting’ the flowering variety onto a vigorous, straight stem of rootstock, our specialist growers have brought you a unique rose bush that will perform well in its first year, with guaranteed results. At Less than HALF NORMAL NURSERY PRICES, these patio standard roses are AMAZING quality and SUPERB value for money. Supplied as bare root bushes your roses are ready to be planted immediately upon receipt, supplied approx. 60-70cm tall. To prune, just remove any dead, dying, damaged and diseased stems and also deadhead regularly.Traditionally, you would cut just above a leaf joint with a sloping cut away from the bud, however, this isn't necessary, and don’t worry about pruning too much - roses are very resilient and will grow back. When pruning, make sure that your secateurs are clean and sharp to prevent squashing stems and introducing disease.